The Florida Bar Board of Governors Eighth Judicial Circuit representative Carl Schwait discusses the legislative amendments recently made to rule 4-7.22. 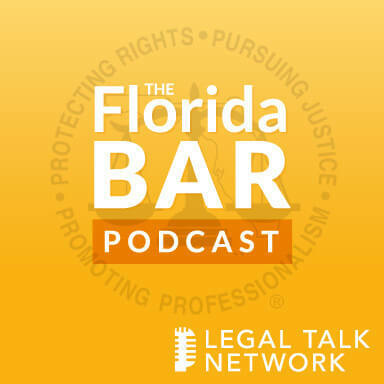 Renee Thompson: Hello and welcome to the official Florida Bar Podcast brought to you by the Practice Resource Institute on the Legal Talk Network. The Practice Resource Institute is the Florida Bar’s online center for Practice Management Information, dedicated to Florida attorneys. My name s Renee Thompson and I will be your host today along with John Stewart. John Stewart: Thanks for having me. Renee Thompson: Our guest today is Carl Schwait. He is a mediator with Upchurch, Watson, White & Max. Carl, thank you joining us. You are a member of the Board of Governors, correct? Carl Schwait: Yes this is my 12th year on the Board of Governors representing the Eight Judicial Circuit. Renee Thompson: Well thank you for being with us. We are here to talk about some amendments to rules, specifically rule 4-7.22. Tell us a little bit about what the Board of Governors consider today with regard to that. Carl Schwait: Last May 2015, I had the privilege of arguing before the Florida Supreme Court Rules that came through the Board Review Committee of the Florida Bar and then the Board of Governors. That specifically were aimed at lawyers and their relationship with what’s called Lawyer Referral Services. The Florida Supreme Court however did not agree with some of the issues and some of the rules that we had promulgated. And I shouldn’t say didn’t agree, what I should say is, they had some of their own thoughts and they asked us to go back and re-look at the rules and gave us approximately a year to reevaluate them. I was pleased that I was the Chairman of that committee along with your co-host John Stewart who was the Chairman of the Tech Committee. Now, why is that Renee? That’s because the relationship of lawyers to clients, and clients to lawyers and their procurement is much more guided through the Internet than ever. It’s just like in the old days when in fact people went to the phonebook and then after that they listen to the radio and then they went to television and billboards, well today’s statistics are showing us that the public is looking to the Internet for procurement of attorneys. And so, therefore attorneys have to as well look to the Internet for procurement of their clients and that has brought to us in Florida a whole new group of for-profit corporations, and companies and people whose chief aim is to match lawyers and clients. And for that reason Florida wanted to be ahead of the bar, we wanted to be futuristic, we wanted to be progressive and we made a complete overhaul of our what was formally called Lawyer Referral Services. Renee Thompson: And tell us, how long was your committee along with the Technology Committee reviewing these rules for overhaul and consideration by the court? Carl Schwait: We started in September right away, in which we met first biweekly, then weekly at Board of Governors meetings and we realized that we needed to meet even more. That was the Board Review Committee, the Tech Committee and several members of the PEC of the Florida Bar and we all met together with the understanding that only the Board Review Committee, the BRC votes, but we had to have first reading that happened in March. So in March we presented to the Board of Governors our first reading and at the same time we asked the Supreme Court for a three month extension. Renee Thompson: Wow! Sounds to me like a lot of work has gone into this. Carl Schwait: It has, but I do need to tell you, we were finished our work in March but the three-month extension was so that we could go out and have a very fruitful and healthy conversation with both the membership and the public. We felt that now before the Board of Governors voted on the final rules, we needed to go out to our membership and talk to them and that’s why we were given three months. John Stewart: So Carl, I have two questions for you, they relate a little bit to the reasons for the rule change. Number one, when you mentioned you last argued the prior rule for the Supreme Court, was there a much discussion at that time about the online platform or the online proliferation of these legal service providers or matching services? Carl Schwait: John, there was absolutely no word and that’s because of our rulemaking process, whether there’s another way to do it, I don’t know, but it’s slow. And so when we were beginning our initial work 6 years ago on Lawyer Referral Services, there were no online platforms. It was only within the last year or two that these platforms became such a part of our everyday life, but at the same time we had already completed the rules and we are merely waiting for a hearing date in front of the Supreme Court. John Stewart: So one of the major changes in the rule seems to be definitional, getting away from the term lawyer referral service. What was the motivation the Committee is thinking for that? Carl Schwait: We wanted to get away from for-profit matching services arguing with the Board of Governors over whether they were a directory, whether they were a lawyer referral service or whether they were some other entity. You see, many of these services didn’t want to be lawyer referral services. One, if they are a lawyer referral service, the lawyers involved with them had to follow very strict guidelines. Two, if they would designate a lawyer referral service in Florida, would there be a designated lawyer referral service in another state. So John, we thought that if we got away with — and did away with all words and just called them qualifying provider, every single entity or person who was in the business of matching attorneys and clients would all fall within our rules. John Stewart: So in summary on this issue, do you feel like we have broadened the net really to make sure that we encompass more providers than maybe under the existing rule that we have now? Carl Schwait: Absolutely. There will not be any provider that does not follow the rules. And by the way, I want to make sure everyone understands, The Florida Bar does not oversee lawyer referral services or now qualifying providers; our rules are to the lawyers who participate in this matching program. So yes, every single for-profit qualifying provider will now have to ensure that they follow the rules so that the attorneys can participate. John Stewart: So with what you just said in mind, it strikes me that as we govern lawyers this rule change actually makes it easier for two things; lawyers, one, to understand which services are subject to the rule; and two, what the lawyer has to do to be sure that they are in compliance with the rule. Carl Schwait: That’s correct. What we have here is exactly what the Federal Courts would like us to have, a very bright line as to what lawyers have to do if they wish to participate in this program. Why is that important, because it protects the public and that is our primary goal, to protect the public in the matching process of lawyers and clients. Renee Thompson: Could you tell our listeners how this will impact voluntary bar lawyer referral services? Carl Schwait: Well Renee, it should not affect a Voluntary Bar Association at all; that issue is a whole another world of where The Florida Bar as well as the Voluntary Bar Associations, hopefully together, are looking into how they can strengthen their services. This rule is specifically for for-profit qualifying providers or services that provide matching. John Stewart: And so our listeners understand The Florida Bar Board of Governors passed this rule today, July 29, but ultimately this comes before the Florida Supreme Court who has the ultimate decision making authority on whether or not the rule be effective. Carl Schwait: That’s correct. We will send this next week to the Florida Supreme Court. We will then await — well, then there will be a comment time for people to comment on it, then the Supreme Court will give us a hearing, and then hopefully they will agree with the rules that are passed. I will tell you once again that if they are passed and anybody has objection and files a suit, it’s the Federal Court that will be looking at these issues. Renee Thompson: One of the questions I have dealt with the hearings that may be involved with this before the Florida Supreme Court. My understanding is you have actually participated in oral arguments before the Florida Supreme Court previously on out advertising rules. If they ask for oral argument on these rules, would you be the person who will argue them before the court? Carl Schwait: Well, that would be the discretion of leadership of The Florida Bar and our President, but I would be glad if I could say this to argue and discuss this in front of the Supreme Court as I have done in the past. John Stewart: I think we all want Carl to make the argument with his experiences and hopefully some of us would be sitting next to him. I think it would be helpful for the lawyers to understand that generally most of the requirements of the rule were maintained, but we did delete a few modest requirements, one of which has been discussed about is the malpractice insurance requirement. Would you like to share the thinking of the Joint Committee’s efforts and why that requirement was removed? Carl Schwait: Sure. Now, in the old rule a lawyer who participated in our for-profit lawyer referral service and, by the way, even for a nonprofit, which is under Chapter 8, but let’s just talk about this rule, had to have a 100,000 dollars of malpractice insurance. We felt that that would be a penalty for those lawyers who wanted to participate in any way with these matching services. Many criminal attorneys don’t carry malpractice insurance. There is no requirement in Florida for any lawyer to have malpractice insurance unless they are dealing with a voluntary Bar Association referral service. So we felt that in reality that was for the client to request. If a client wants to make sure that an attorney has malpractice insurance, they will ask, much like you might ask a painter or a worker who comes to your house whether they have insurance. So we felt that we didn’t want to say that some lawyers had to have insurance and others didn’t, so we did a way with that requirement. John Stewart: If I could just make one brief comment, in general, I think for the benefit of the attorneys in this rule what you’ll find is what we call a safe harbor or a take-down provision, and the comments are really important to this rule in my mind, and they describe due diligence that the attorneys must go through before engaging with a qualifying provider. And if they do, the Bar will notify them, if the Bar determines that the provider is not in compliance, and so the attorneys have sort of a safety net in the event that they do follow their due diligence before engaging with a qualifying provider. Carl Schwait: John, that’s an important point, because I think lawyers have to understand that the Florida Bar is not in the job of making sure that we sanction lawyers. In fact, we feel that if lawyer does something wrong we would like to rehabilitate the lawyers, but in this case, sometimes they are not quite aware that the qualifying provider may be mis-stepping, or their advertising may be improper. So what we do is, our regulation department will send them a letter or contact them. We will give them the time that they need to get out of their relationship because we want to make sure that lawyers do what’s right, and once again, that’s why the rule is important, it’s a very bright line. This is what the qualifying provider has to do, this is what the lawyer has to do. Renee Thompson: It seems that these rules provide more certainty to the lawyer about whether or not they can participate in a program of a qualified provider. While they are getting that certainty it also seems like this is accomplishing what the Florida Supreme Court has asked the Board of Governors to do, which is define new and meaningful ways to connect the public with lawyers for access issues. So it seems to me that it’s a win-win on all fronts as I’m seeing it? Carl Schwait: It’s a win-win, because now more lawyers will be able to participate with qualifying providers, because we brought more qualifying providers into the tent. So while some people think it’s more liberal rules, what we are is we are saying anyone who wants to participate in the matching service must follow certain rules, but by doing that we are allowing more lawyers to participate, we are allowing more qualifying providers to participate. And it’s important, Renee, because almost 55% of our lawyers are single practitioners, and they need other means to get work and the future of not only law but all professions is the platform of computerization and going to want your phone or your computer, and we think that’s what this does. Renee Thompson: Great. Well, some closing thoughts as we wrap up here today. First of all, thank you for your time for all that you have done within the past year to not only bring these rule amendments to the Board of Governors, but to really explain them to our listeners here today. All your listeners who would like more information, how would they contact you? Carl Schwait: Well, you can of course, go on The Florida Bar website. The Florida Bar website talks all about the new rule, it has questions, it has answers, it has a history. You can call Communications at The Florida Bar or you could call me if you want, which is HYPERLINK “mailto:[email protected]”[email protected] If you would like just write to me and I’ll be glad to write back and talk to you about our new rules. I do need to say that the next step will be looking forward to a hearing in front of the Florida Supreme Court. If I could say, one other thing, I think that the three months that we’ve all just spent, and I mean the Board of Governors going out to the public, The Florida Bar News or communications through emails has been very, very productive for healthy discussion on the rules. And I hope this will be a good example of how The Florida Bar is going to go forward on all the major issues. I think that this is the new Florida Bar in terms of communication and the new Florida Bar in terms of inclusive everyone’s opinions and thought processes. Renee Thompson: All right, well, that brings us to the end of our show. Be sure to check out HYPERLINK “http://www.legaltalknetwork.com” legaltalknetwork.com or you can follow us on iTunes, Twitter and Facebook. Thank you so much listening, and join us next time for another great episode of the official Florida Bar podcast. Join host Adriana Linares for her next podcast on practice management, leadership, and what’s happening in Florida Law. Subscribe to the RSS feed on HYPERLINK “http://www.legaltalknetwork.com” legaltalknetwork.com or in iTunes.